Complete Solution For Piping Materials of Stainless Steel & Duplex Steel Tubings, Pipe Fittings, Valves etc. 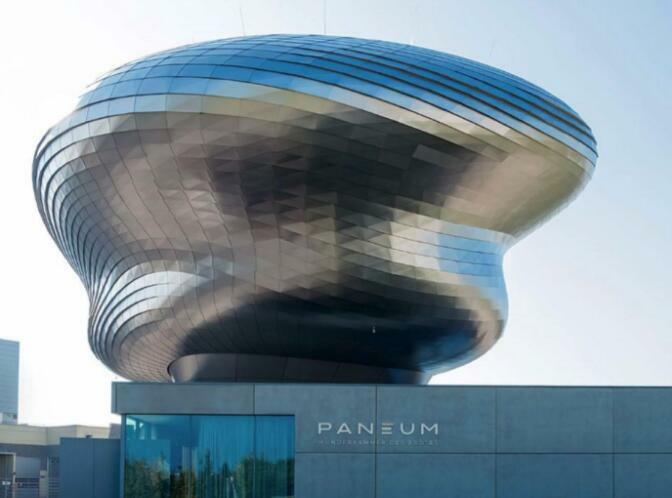 The famous architectural firm, COOP HIMMELBLAU, designed a bread museum (PANEUM) for the bread ingredient supplier Backaldrin in Asten, Austria. It consists of two parts: a square box-shaped base and a “suspension”. Two-story free display space above it. The two parts are made of different stainless steel materials in sharp contrast: the square box part uses the cast-in-place concrete façade, while the museum's exhibition space uses a round wooden structure to cover the stainless steel veneer. A total of 3,680 stainless steel clad plates were used, with a stainless steel material of 316L and a glass bead blasted surface with a thickness of 1.0 mm. The square base section includes halls and conference halls, which can be used for exhibitions, receptions, etc., and can accommodate up to 120 visitors. The design concept of the exhibition space comes from the collection form of the “Chester House” in the Baroque period, which is very suitable for exhibiting a series of unusual small objects with the theme of “bread”. In the center of the Bread Museum is a circular atrium, with some specially selected items hanging from the top like crystal chandeliers. On the spiral staircase embedded in the atrium, visitors can enjoy the exhibits from a variety of angles. From the spiral staircase you have access to the two-floor exhibition area, all of which are accessible by lift. The walls, counters and showcases of the museum blend into the building to help enhance the display. The atrium is illuminated by natural light from above and the exhibition space uses artificial lighting. Inside, you can see the circular outer shell of the self-supporting exhibition space, which is made up of cross-laminated timber. This construction method enables the free form. The highly prefabricated 3D CNC technology shortens the construction time, and the precisely shaped wood is exposed indoors, with only a layer of lacquer, so that the interior space does not need to be over-decorated. If you have any requirement or comments, please do not hesitate to contact us or submit the table bellowing.